Samsung’s no stranger to the smartwatch, but it’s taken the arrival of the Gear S2 for it to finally embrace circular displays. There are two models, both with the same core specifications but catering to different tastes. The regular Gear 2 is the more minimalistic, futuristic of the two, with rubber straps and a smooth finish. In contrast, the Gear S2 classic has a shiny black casing, a ridged bezel, and leather straps. Bands on both can be switched out, but Samsung has used a proprietary connector on the Gear 2; you’ll have to pick between its own range of options. The Gear S2 classic, however, uses a traditional 20mm band, which means you can pick up any third-party strap and fit it. That might not be as straightforward to do as with Samsung’s own, though, which have a small clasp for tool-free removal. While the 1.2-inch, 360 x 360 circular AMOLED touchscreen is the obvious point of interaction – bright, and with great viewing angles – the interesting part is the rotating bezel. 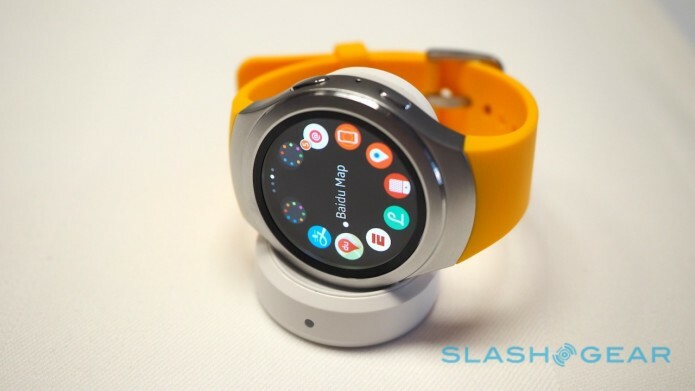 Samsung has turned it into a jog-wheel to navigate through the Gear 2’s interface. It’s arguably an obvious solution, but Samsung has done it particularly well. The ring rotates with just enough notchy, tactile feel to make it mildly addictive; I can see myself twiddling it back and forth during meetings like a stress reliever. It’s a very different – but equally satisfying – approach that Apple took with the digital crown on the Apple Watch. There’s a back button on the side, along with a second key that both jumps back to the watch face and then opens up the app launcher. That arrays its – notably Apple Watch-esque – icons around the edge of the screen, navigated with the bezel. The usual notifications of calls, messages, and calendar appointments is supported, along with S Voice speech control, a local music player taking advantage of the 4GB of internal storage, a mapping app, weather, and a gallery. Fitness is a big area of focus, with both S Health and the Nike+ Running app loaded. They tap into the accelerometer, gyroscope, and heart rate sensor, with the S2 automatically switching between activity modes – as well as how frequently it takes a heart rate measurement – depending on your level of activity. A smartwatch is more than the features it has out of the box, and usually that means reaching for either the App Store or the Play Store. Samsung is stubborn, though, and still unwilling to place its entire wearable destiny in Google’s unpredictable hands. Tizen remains its primary strategy there, and the Gear S2 arrives with a fairly long list of software partners to try to plug the biggest complaint about the OS, that third-party apps are in short supply. To be blunt, Tizen still lags both Android Wear and Apple Watch in software. Samsung has done a good job of filling in some of the more obvious gaps, however: the Gear S2 will have access to apps from Uber, Twitter, Yelp, Nike+, and SmartThings, for instance, together with news feeds from various publishers. There’ll also be some high-profile automotive tie-ins, with both VW and BMW having Gear S2 apps that allow for things like remote lock/unlock and directions back to wherever you parked your car. Android Wear may have the edge in software, but Tizen does have its advantages, not least in circular UX. Samsung has done a far better job of tailoring its smartwatch interface to a round display, feeling like it was actually designed with the Gear 2’s screen in mind, rather than forced to its constraints like Android Wear can. Samsung throws plenty of watch faces on there too, including both modern and classic styles, and the dials, complications, and other features can be customized. Some of them are activity-based, animating according to what you’re doing. The S2 will pair with any Android phone running 4.4 or above, and with 1.5GB or memory. If you’re away from your phone, its WiFi b/g/n means it can still receive messages funneled through the cloud; 3G variants will do the same through cellular networks. However, if you’re not using a Galaxy you’ll miss out on a few key features, most notably Samsung Pay. That uses NFC for mobile payments, and can show barcodes for loyalty cards, but unlike the Galaxy Note 5 and S6 edge+ you don’t get magnetic strip emulation. Charging is via an included wireless dock, with Samsung saying the 250 mAh battery should be good for 2-3 days of use. The waterproofing has been slightly upgraded over Samsung’s older models, too, now IP68. That means up to thirty minutes under 1.5 meters of water, though it’s worth noting that doesn’t include actually moving. Samsung isn’t recommending you go swimming with the Gear S2 on. What I’m more interested in are Samsung’s plans for integrating the watch with the Internet of Things. Initially that’s going to mean things like SmartThings integration, the automation hub company Samsung acquired recently, but eventually the goal is to turn the S2 into a remote control for each factor of your life, whether at home, at the office, or somewhere in-between. Samsung’s calling the Gear S2 the “ultimate intuitive wearable experience,” though I’m not entirely convinced. While I like the ergonomics and the design, and the screen and UX combination are great, I’m reserving judgement on Tizen. Apple Watch and Android Wear undoubtedly have more brand recognition, and as developers dip their toes into wearables there’s every chance that Samsung’s platform of choice is going to end up the Windows Phone of the smartwatch world: a distant third choice. We’ll find out for sure next month. The Gear S launches in the US in October, with pricing to be announced closer to that point. Specific availability of the 3G model will depend on the carriers themselves.